In the current climate of disinformation about WikiLeaks, let’s sharpen our eyes to discern social media accounts and websites self professing incorrectly affiliation with WikiLeaks.org the publishing organisation. I am talking about accounts that intentionally and with ill intention, mislead the public as to who they are and create the impression that they represent WikiLeaks. I will compare below by example how WikiLeaks named platforms (in Twitter, Facebook, Website) present themselves and what the implications might be. Let’s examine a historic and a current account. A single Twitter account: WikiLeaksItaly @WikiLeaksItaly created in September 2010 during a time when the trend was to create Twitter accounts with the name WikiLeaks plus a country or continent like @WikiLeaksFrance @WikiLeaksUSA @WikiLeaksEurope @WikiLeaksCanada. The account was active up until October 2012 sharing quality news articles and re-tweets of major protagonists of the early days of WIkiLeaks. It twitted mostly news articles in English but other languages too like Italian. Despite the choice of name it was evident this account was not claiming affiliation with WIkiLeaks and it was a news sharing account positively inclined towards WL. In November 2012 the account changed behaviour tweeting mostly links from Human Rights Watch, the US NGO, as if it was operated by a bot, and it became inactive later that year. This account never tried to mislead its followers that they are affiliated with WikiLeaks or in any way represent them. 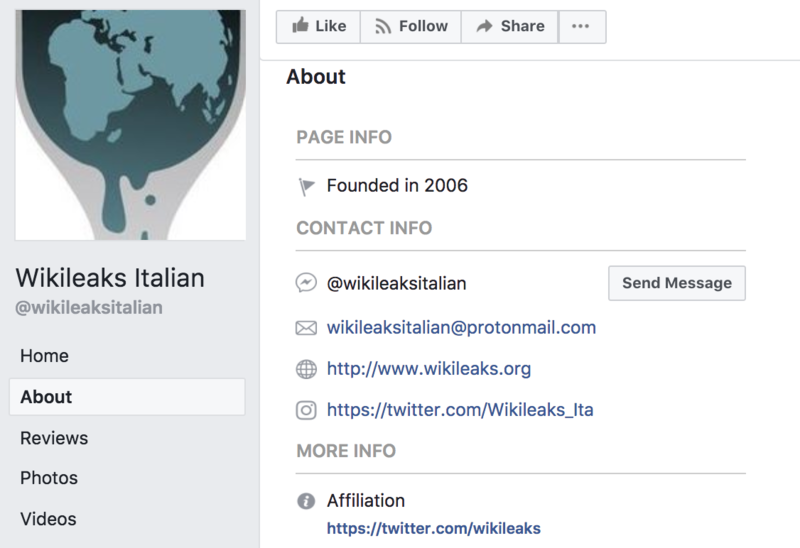 There is a bogus "WikiLeaks Italy" [@wikileaks_ita] and associated Facebook account. Its intent is not clear but it has become more active as the Italian elections approach. It is not endorsed or approved by @WikiLeaks. The only official WikiLeaks account is @WikiLeaks. This account clearly claims affiliation and misleads its followers as a result. Why would it do that? The pages in Twitter and Facebook are full of Movimento 5 Stelle M5S supportive messages in between news about WikiLeaks. It clearly pushes a political message giving the impression the Julian Assange and WikiLeaks as an organisation endorses this particular political movement. This is the impression that it gives and it is wrong. I hope the people who run the pages realise that such behaviour appears suspicious. It is not the first time that a group of people whilst using WikiLeaks brand and pretending affiliation they have been revealed to be undermining the organisation in social media. WikiLeaks has nothing with these pages and if the people who run them are truly supportive of WikiLeaks work and organisation, have now the opportunity to stop misleading their followers.